Well this is just getting insane. 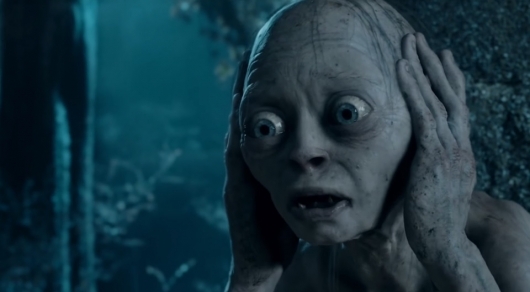 Less than one month ago came word that the first seasons of Amazon’s Lord of the Rings would cost more than all three movies in Peter Jackson’s film trilogy. Around $500 million. But that’s just the beginning of the craziness. Amazon’s adaptation is going to cost hundreds of millions more than Jackson’s trilogy. In fact, it’s expected that once all the costs of producing the show are factored in—including casting, producers, visual effects, and so on—the price tag will be over $1 billion. BILLION. For a television show. It’s going to be the biggest TV series ever produced in terms of price tag. Last November came confirmation that Amazon had landed the rights to J.R.R. Tolkien‘s book series The Lord of the Rings, and that they were committed to producing multiple seasons. While the news was exciting the announcement also came with the astonishing revelation that Amazon had reportedly paid around $250 million just for the rights, leaving many to wonder just how massive the show’s price tag would be once they got around to actually making it. Now we have a better idea of what that is. 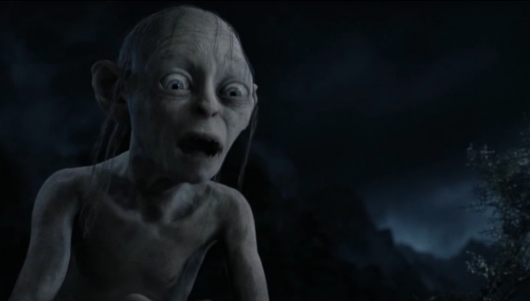 A new report indicates that the overall budget of the first couple of seasons of the show will likely surpass the total cost of Peter Jackson’s beloved Lord of the Rings film trilogy. If you’re a fan of movies, chances are you’re a fan of movie scores. But while the music of a film can elicit emotions and enhance our experience viewing it and overall appreciation of it, sometimes there’s so much more going on in those compositions than most of us ever realize. With an example of this, YouTube user The Nerdwriter has released a new video exploring composer Howard Shore‘s work on Peter Jackson’s The Lord of the Rings trilogy, and how his music actually elevated the already stellar story it told. What happens when a geek finds themselves abundantly wealthy? They purchase massive homes and add lots and lots of amazing stuff to them. 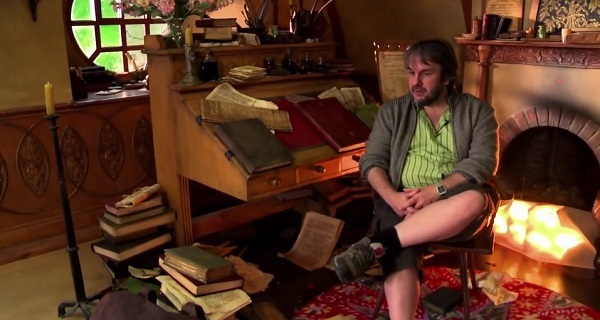 We’ve seen it with Guillermo del Toro’s Bleak House, and now we have another example with The Lord of the Rings and The Hobbit trilogies director Peter Jackson‘s 1930s mansion in New Zealand. Jackson has had all sorts of cool stuff built to make his home unique, but perhaps most notably is the addition of an exact replica of Bilbo Baggins’ Hobbit house, Bag End. And better yet, Jackson had it built underground, behind secret doors. 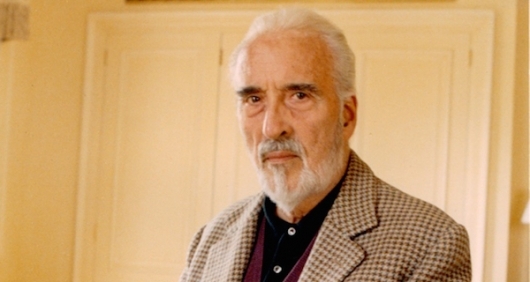 Legendary actor Sir Christopher Lee, best known to modern audiences for his role as Saruman in Peter Jackson’s The Hobbit and Lord Of The Rings film trilogies, died on Sunday in a London hospital after suffering from respiratory problems and heart failure, according to The Guardian. He was 93. Danish former model Birgit Kroencke Lee, his wife of over 50 years, reportedly delayed releasing the news until today so that family could be notified first. In honor of St. Patrick’s Day, ThinkGeek has brought back a variation on their limited edition Kiss Me I’m Elvish t-shirt and is offering it for FREE today with the purchase of $30 or more. 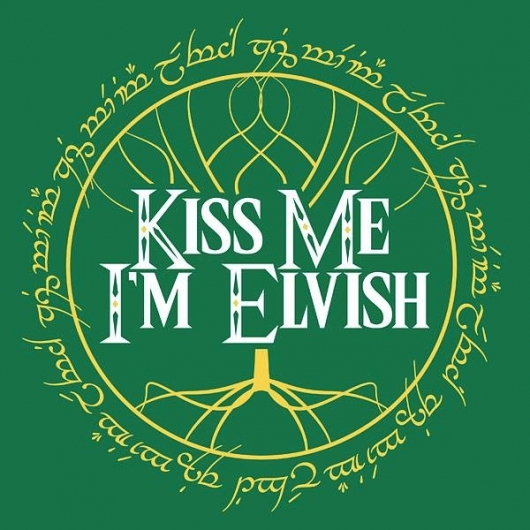 This Lord Of The Rings-inspired 100% cotton kelly green t-shirt features the words “Kiss Me I’m Elvish” in white letters. 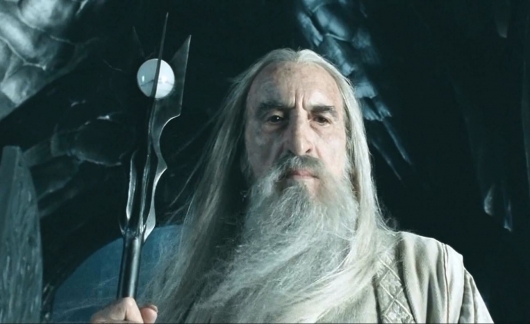 The same phrase is also written in Tengwar in Feanorian script resembling that of the inscription on the One Ring. The background design is inspired by the white Tree of Gondor. 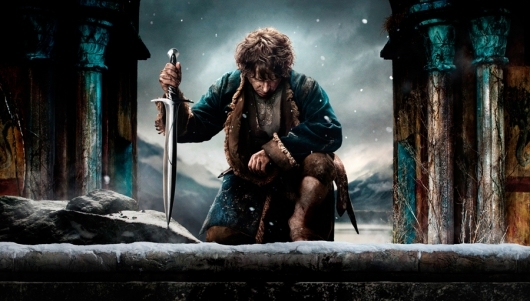 Co-written and directed by Peter Jackson, The Hobbit: The Battle of the Five Armies is the third and final chapter in a trilogy of films based on J.R.R. Tolkien’s 1937 fantasy novel, The Hobbit. At the conclusion of 2013’s The Hobbit: The Desolation of Smaug, Bilbo Baggins (Martin Freeman), Thorin Oakenshield (Richard Armitage), and the Dwarves reclaimed the Lonely Mountain, but failed to kill the dragon Smaug (Benedict Cumberbatch). Unable to reclaim his precious treasure, the dragon fled the mountain and set his sights on laying waste to Lake-town. The Battle of the Five Armies picks up only moments after, with Bard the Bowman (Luke Evans) defending his home against the “Chiefest and Greatest of Calamities.” Meanwhile, Sauron sends forth legions of Orcs to the Lonely Mountain to attack Bilbo and the Dwarves. 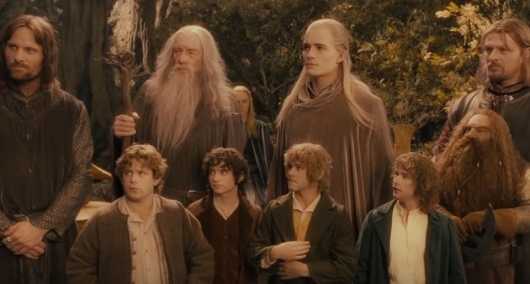 With Gandalf the Grey (Ian McKellen) at their side, the races of Men, Elves, and Dwarves must unite to save Middle Earth from the Dark Lord and his minions. If you have an android-based device of any kind, then you might wanna head over to Google Play and nab today’s FREE gift, The Lord of the Rings: Fellowship of the Ring. The “purchase” will add the movie to your Google Play library and become accessible (in HD, no less!) from anywhere with an Internet connection on a device or conveniently on your Chromecast-equipped television. Deal: Movies & TV Box Sets: Indiana Jones, Star Wars, Avengers, Batman & More!